Automotive stock illustrations and cutaway drawings. Technical artwork and generic car stock image library by Kevin Hulsey. 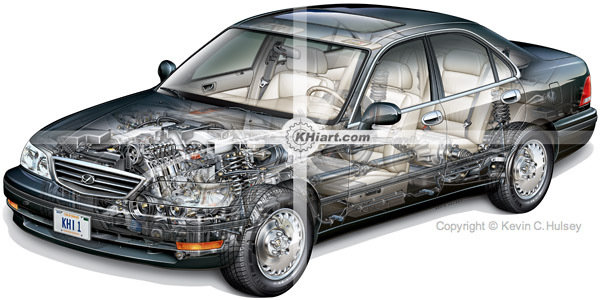 The rights-managed automotive stock image section of our website contains several car cutaway images which are available for resale and licensing. Some of these stock images include cutaway drawings of 4-door passenger sedans, economy automobiles, luxury cars, generic saloon cars, sport utility vehicle SUVs, 2-door front and rear engine sports cars, gas/electric hybrid cars and plug-in electric vehicles. A few of the generic see-through cars and ghosted transparent cars on display were created specifically for aftermarket resale, and are not identifiable with a particular brand, marque or manufacturer. For companies that provided automotive-related products or services, these stock images are a cost-effective solution when compared to producing new illustrations, and in some cases may be up to ninety percent less expensive than creating new artwork. The generic car images on this website are not associated with a specific brand or marque, making them especially well suited for annual reports, in-store point-of-purchase displays, printed marketing materials and website use. Imagery from our library has been particularly useful to companies which manufacture and supply electrical, plastic, rubber and machined or cast parts to the automotive industry as well as manufactures of specialty electronics and computer chips used in engine management, safety and entertainment systems. In the retail sector, these images have been utilized by aftermarket automobile warranty and insurance companies as well as retail automotive repair facilities or parts suppliers. Over the years we have sold 100s of licenses to many of the top fortune 500 companies within the automotive sector. See our full client list for details. All of the drawings, artwork and car-related images in our stock image library are registered with the U.S. Copyright office in Washington DC. Unfortunately, our company does not provide royalty-free images but you may buy pictures of our cutaway cars under a stock image usage license contract. Many of these images and drawings are sold as layered files which can be easily customized to fit your individual needs, or used to create flash animations and interactive website presentations. Please check out each page for details on the available file types and specifics on how the images can be customized. Some images protected by Digimarc digital watermarking. Digimarc & the Digimarc logo are registered trademarks of Digimarc Corp.
All Images Copyright © 1994-2018 Kevin C. Hulsey, Kevin Hulsey Illustration (KHulsey.com), all rights reserved.